A young girl from a provincial town learns the bitter reality of a big city and great love. Van Heflin ... Maj. Sam Huxley - CO, 2nd Bn., 6th Marine Regt. Pvt. Joe Gomez - aka Spanish Joe: What you readin'? Pvt. Joe Gomez - aka Spanish Joe: You mean they wrote a whole big book about Mickey Mouse 's dog? Raoul Walsh who may have directed more good action films than anyone else, did Battle Cry as a tribute to the 2nd and 4th Marine Divisions who fought that very battle in the Pacific Theater of World War II. We follow the Marines from basic training in San Diego to the invasion of Saipan in the Marianas, one of the bloodiest battles of the Pacific Theater. The action is equal on romance as it is on action and we see the lives of several Marines and their romantic encounters. All American kid Tab Hunter is engaged to Mona Freeman, but while in San Diego has an affair with Navy wife Dorothy Malone. When the Marines are stationed in New Zealand, farmer Aldo Ray gets to romance Kiwi farm girl Nancy Olson. whose family has lost plenty in the war. And we see other people who generally typify service pictures, city kid William Campbell, cowboy Fess Parker, intellectual John Lupton, troublemaking wiseacre Perry Lopez, and in his screen debut a most engaging hillbilly, L.Q. Jones. The unit is commanded by Major, later Lieutenant Colonel Van Heflin with second in command Carleton Young and top sergeant James Whitmore who narrates the film and whose eyes we see the story unfold. Heflin is a tough man, but a caring commander. One other reviewer said he was superpatriotic and a crazy man for wanting a combat assignment in the film. Not true at all, his is the profession of arms and his men are Marines by choice, an elite fighting group. This is what they are trained to do and combat is their job. 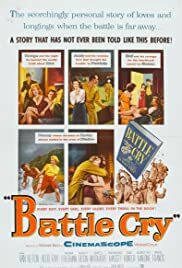 Battle Cry got one Oscar nomination for Best Musical Scoring and it was because of the theme of Honey Babe which was prevalent throughout the film. It had a big success in the Fifties both as an instrumental and vocal hit. The combat sequences were very nicely staged by Raoul Walsh, I'm surprised Battle Cry wasn't nominated in the Special Visual Effects department. It's a fine film, still holds up well and still quite the recruiting piece for the Marine Corps. And this review is dedicated to the 2nd and 4th Marine Divisions who fought and died to secure the island of Saipan in World War II. May we always produce people like these in America.